The 12 burgundy and gold sheets in this digital paper pack are bold and strikingly modern with a multitude of uses. This 12 piece burgundy and silver digital paper pack is a study in elegance because of the contrast between the dark reds of the burgundy (makes us think of fine wine :-) and the glowing silver veins running through the digital papers. The 14 files in this green and silver digital paper pack is a reminder of our glorious planet with its predominant colors of green and blue. The 12 papers in this bold navy and gold digital paper pack are eye-catching because of the strong contrast between the dark navy and the sunshine-bright gold. The 12 papers in this navy and silver digital paper pack are exciting and vibrant because the navy and the silver are in the same color 'family', with much blue in the silver, which makes them a perfect match for each other. The 18 papers in this purple and gold digital paper pack are our absolutely fav backgrounds. Yes, we love ALL our marble paper packs but these rich purple and gold beauties have to get our blue ribbon for the absolute best ones in terms of contrast, drama and gorgeous colors. The 14 papers in this purple and silver digital paper pack would have been outlawed in imperial Rome because only the royal family was allowed to wear purple. The 18 fiery red papers in this red and gold digital paper pack are so stunning that I would love to have some clothing made with this vibrant color combination. The 14 stunning papers in this red and silver digital paper pack display such rich colors that you simply must see them more closely than the tiny images above allow. The 16 papers in this green and gold digital paper pack has such a multitude of greens that there's no way to compare them to the many colors in nature, like: grass, emeralds, leaves, plants galore. We defy you to find anything prettier - and more elegant - than the 20 papers in this pink and gold digital paper pack. 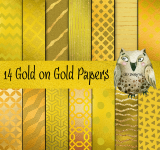 These 14 gold-on-gold digital papers are simply exquisite with their gold foils and gold glitter! This LARGE collection of 45 steampunk digital papers are great for web projects or you can even print them. These 40 linen digital papers are so practical and have a multitude of uses. Instantly download 36 digital papers in this wonderful "American Flag Blue" color that is can be used in literally dozens of ways! Instantly download 37 digital papers in this wonderful "Aqua Pura" color that is can be used in literally dozens of ways!